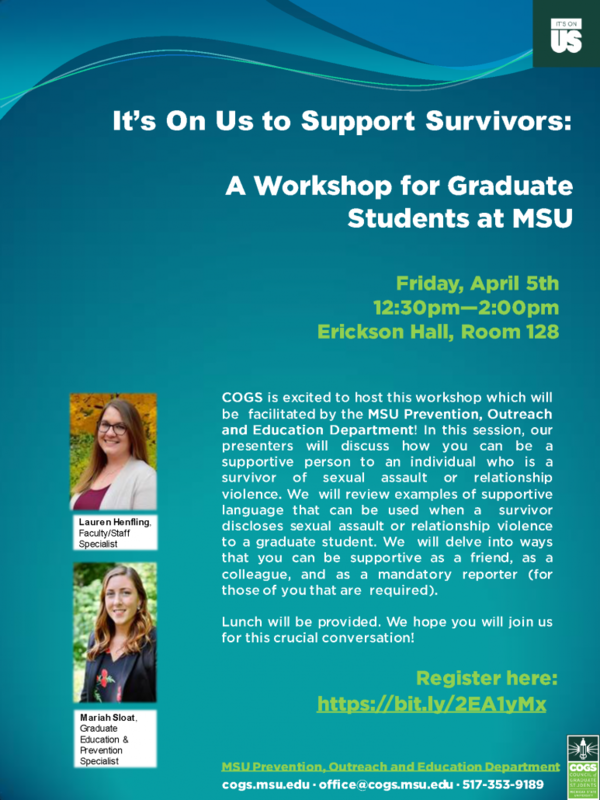 COGS and MSU’s Prevention, Outreach, and Education (POE) Department have teamed up to bring you this dynamic workshop during It’s On Us Week of Action. 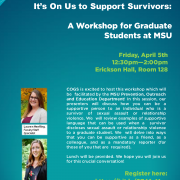 In this session, we will discuss how you can be a supportive person to an individual who is a survivor of sexual assault or relationship violence. We will delve into ways that you can be supportive as a friend, as a colleague, and as a mandatory reporter (for those of you that are required). Lunch will be provided. We hope you will join us for this crucial conversation! Lauren Henfling is a clinically licensed social worker and has spent her career working with survivors of domestic and sexual violence. Most recently, Lauren worked in post arrest crisis intervention with survivors of domestic violence, where she coordinated with local law enforcement agencies and provided on-the-scene crisis intervention and advocacy services to survivors after an assault. Lauren is passionate about creating a campus community where survivors are believed, validated, and given opportunities to excel. Mariah Sloat has a bachelor’s degree in community health education and a master’s of public health (MPH). Mariah has experience providing prevention education focused on bystander intervention, consent, sexual harassment, sexual assault, and relationship violence. She is passionate about engaging students in conversations about being an active bystander and stepping up to change the culture.